Summer is an exciting time for children. It’s a time to play, grow, and explore while making cherished memories and forming lifelong relationships. 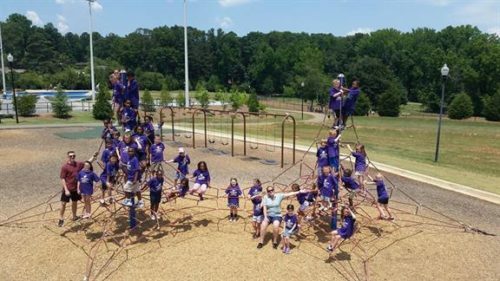 At Discovery Point Zoar Rd, we help your child discover the full potential of summer fun through our summer camp offerings for the families in the Snellville area. Our programs provide an exciting way for children to get the most out of their time off from school through plenty of opportunities for learning new skills, going on adventurous field trips, and having the time of their lives. We’ve built the “Discovery Point Mighty Me” summer camp program for 2019 around developmentally appropriate literature selections that inspire weekly “mighty missions.” These missions involve theme-based activities and excursions that encourage students to hone in on their problem-solving skills as they learn what team building is all about. We’ve designed ten weekly themes to provide the inspiration for our mighty missions. From caring for animals to finding their own inner superhero, children will learn valuable life lessons in a hands-on way. Campers can explore the impact and importance of companionship, sportsmanship, and kindness while challenging their own abilities, making new friends, and becoming true team players. We also embark on exhilarating adventures that allow campers to use their imaginations as they take on challenging roles, including an adept archeologist, a sleuthing spy, and a celebrated superstar. We love how this creative approach gives our campers something new and exciting to look forward to every single week. Each weekly theme utilizes a piece of creative and engaging literature, promoting the development of language skills and literacy while encouraging children to embrace a lifelong love of reading. With plenty of opportunities for learning and building important academic skills in fun and stimulating ways, your child will be fresh and ready to go when the school year rolls back around. Learn more about our summer camps in Snellville today. Just drop by our child care center or contact Discovery Point Zoar Rd at (770) 985-9555 for details.